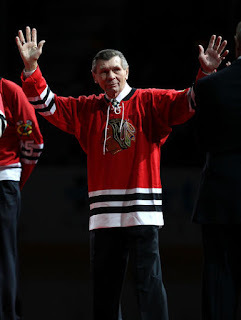 The hockey world mourned today as Chicago Blackhawks Legend, Stan Mikita passed away at the age of 78. Mikita was diagnosed with Lewy Body Dementia, which effects one's memory, similar to Alzheimer's Disease, along with one's movement, similar to Parkinson's Disease. 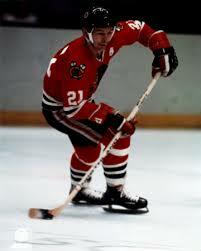 When you think Chicago Blackhawks, you think Stan Mikita. He spent his entire 22-year career in Chicago. He is the franchise leader in games played (1396), assists (926), and points (1467). He is second on the franchise goal list (541). He is the only player in NHL history to win the Art Ross Trophy (Top Point Scorer), the Hart Memorial Trophy (League MVP), and The Lady Byng Memorial Trophy (Gentlemanly play) in the same year...twice...in a row. Mikita left his home land of Czechoslovakia, at the age of eight, to escape the Communist-controlled country to live with is adopted aunt and uncle in St. Catherines, Ontario. "Stosh" did not start his career very gentlemanly. For a player standing 5'9", weighing 169 lbs., you would not think he would have a streak of violence. But, for his first six NHL seasons, he averaged 113 penalty minutes. After he became a father, he changed his play and averaged 39 penalty minutes a year for his remaining 15 seasons. 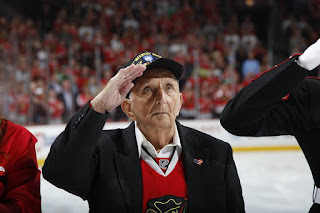 In 1961, he helped bring the Stanley Cup back to Chicago after a 23 year absence. He is credited with inventing the curved stick. He also was one of the first players to wear a helmet after a puck struck him in the ear, which required stitches. Mikita was inducted into the NHL Hall of Fame in 1983, and his No. 21 rests now in the rafters at the United Center, when it was originally raised in Chicago Stadium in 1980. He was named as one of the Top 100 Greatest Players in NHL history. In 2008, Blackhawks owner Rocky Wirtz brought Stan Mikita back as a team ambassador to help bring back a generation of Blackhawk fans. Stan Mikita was a Chicago icon on and off the ice. Arguably the greatest player in Blackhawks history, his disease may have taken away his memories of what he did for the Blackhawks and the city of Chicago, but the Blackhawks and the city of Chicago will always remember Stan Mikita.